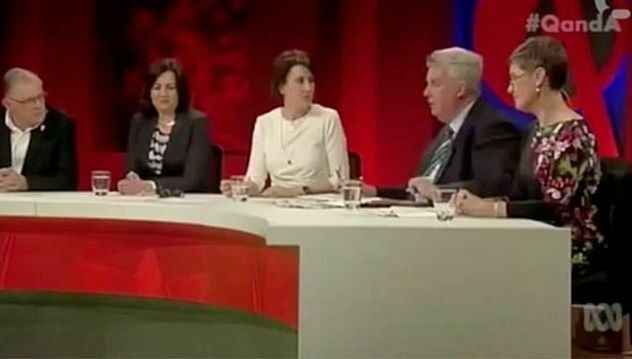 Managing editor David Donovan considers the appearance of former Senator Ron Boswell on ABC Q&A this week and what it says about the National Party. IT HAS COME TO MY ATTENTION that many people were bemused by the appearance of former Queensland National Party Senator Ron Boswell on ABC Q&A on Monday night. Perusing social media, I see some have been left perplexed after seeng a former senior politician so utterly confused and seemingly bereft of any information inside of his head. As someone born and raised near Dingo in Central Queensland, who has mingled his blood and sweat with the desert lands west of the Great Divide and who has been actively involved in agriculture almost his entire life, I have a solid understanding of both the National Party and its primary constituency — country people. I have also met Ron Boswell in person. Therefore, I feel I am in a good position to provide some answers to these very reasonable questions. As to the first question, I think it is extremely unfair to suggest that Boswell was drunk. On Valium, maybe, but certainly not drunk. If he was drunk, I would have expected a true conservative gentleman like him to be far more ebullient and even more opinionated, and to not allow the female panellists to talk at all, rather than simply talking over them half the time. In fact, Boswell was neither drunk nor drugged, but simply acting in the traditional fashion of the northern hairy-nosed wombat after it has emerged from its burrow — slow-moving, wary and blindly blinking at the light until it had becomes acclimatised to its new surroundings. As to whether Boswell had ever read a book, I’d simply say you don’t become leader of the Nationals in the Senate by wasting your time reading books and learning so-called “facts”. Shoring up his numbers to ensure he had first place on the Senate ticket, along with those endless tedious lunches with coal miners ‒ both domestic and sub-continental ‒ would have ensured the former senator had little time to waste perusing the manifestos of dope-smoking, atheist, leftie academics. He can read, though, as I can personally attest. I will get to whether Boswell knows anything at all shortly. As to the question of “is that the best the Nationals have to offer”, the answer is a resounding “yes”. The truth of the matter is that although the Nationals have a reasonably large membership ‒ virtually all bushies support the “Country Party” ‒ their leadership stocks are rather barren. I mean, Warren Truss is their leader — a man who with less charisma than baling twine. Still don’t believe me? In that case, I offer you Bananaby Joyce. You see, most people working on the land are simply too broke and too busy to find time for all the meetings, travel and flesh-pressing required to become a successful politician. The only people who have this amount of time on their hands are either wealthy landholders, who have other people to do all the farm work for them, or people who don’t work on the land at all but like country music and therefore see the Nationals as a legitimate vehicle for political advancement. Ron Boswell would appear to fall into the latter category, however it is the former who are by far the more insidious curse upon the Nationals. You see, wealthy property owners ‒ many the remnants of the old squattocracy‒ don’t give a fig about ordinary National Party voters. In fact, they are very happy to see most of them go broke, as farmers almost always do, so they can acquire their land and expand their already extensive holdings. This explains many of the Nationals' strange policies and why vested interests like mining are always given preference by the Coalition over farming concerns. Next, we come to how Boswell came to be elected and why people still vote for the Nationals. This is because country people are innately conservative and have a deep loathing of the only other party remotely interested in them — the Greens. Many, if not most, think of the Greens as hemp-wearing socialists who want to take away their land because it contains an endangered snail or something. This, clearly, is a slight exaggeration; not all Greens care for snails. In any case, most rural folk will always vote for the Nationals and never vote for any other party, even though they can see their Party selling them out every election. Ron pulled a thick wad of crumpled A4 pages from his suit jacket and began to speak. And he continued to speak in his monotonous rustic drawl for well over an hour, dutifully reading every ill-conceived word. There are only two things I remember clearly from this tedious address. Firstly, that Boswell talked alot about something called “advocados”. On the drive back, I asked my brother later what these “advocados” might be, thinking maybe they were a new and improved form of the traditional avocado. He said he didn’t think so. I still don’t know what an "advocado" is. Is it a tropical fruit used in marketing? A Spanish lawyer? Who knows? Secondly, Boswell spent most of his address praising the wonders of the Free Trade Agreement his Government had recently signed with the United States. However, given this FTA provided no access for Australian avocados into the U.S. market whatsoever, you could say the avocado growers were somewhat less enthusiastic about the virtues of this pact than the buffoon droning away at the front. To say the growers were stony faced at the eventual end of Boswell's speech would be a grave insult to stones. Now, perhaps the agreement did provide great access for advocados and, in some sort of administrative SNAFU, Boswell had picked up the wrong speech? We’ll never know, because the great big hairy-nosed wombat snuffled off immediately at the end of formalities without stopping to speak to any of this convenient assembly of his core constituents. Far too busy? A helicopter to catch? Or maybe just didn’t give a stuff about them? Whatever it was, he left with a beaming smile on his big vacant face, clearly very pleased with how it had all gone. Another job well done. Just like he probably did on Monday night, the silly wombat. It's no joke. Subscribe to IA for just $5.